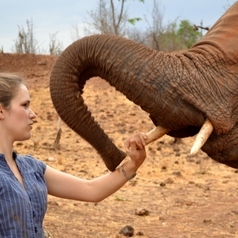 I'm a PhD student studying the social cognition of the African elephant under the supervision of Professor Richard Byrne at the University of St Andrews. I'm using experimental methods to test aspects of elephant cognition in a captive setting. I'm hoping my work will add to a more thorough comparison between great ape cognition and that of elephants, so that we can better understand how particular cognitive abilities evolve.